This study introduces the free vibration of single-walled carbon nanotubes conveying fluid. The variational iteration method is applied to the problem of single-walled carbon nanotubes. The governing equation is based on the model of the beam with the local, coriolis and centripetal acceleration components. The velocity of fluid flow is assumed as a constant mean velocity. The numerical results are illustrated for this method with high accuracy and simplicity. ISNAD Dönmez Demir, Duygu . "The numerical approximation for the single-walled carbon nanotubes conveying fluid". 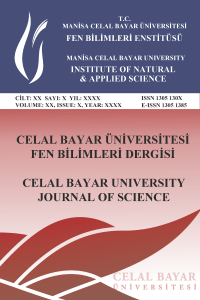 Celal Bayar University Journal of Science 12 / 2 (August 2016): 0-.